The premise of Holy Land is that there is a revitalization of the militant Arab world. They then challenge the Israelis, using not only conventional military forces, but also the full spectrum of conflict, including insurgency and terrorism. The game includes several possible scenario options for different types of conflict. Holy Land game shows some of the major factors involved. The Holy Land game system is based upon Decision: Iraq; there are two players in Holy Land, various Arab powers and foreign fighters, the latter possibly including Al Qaeda and Iranian support, among others, and the Israelis, with possible coalition support. Both players have a set of pieces that represent both conventional and unconventional forces. 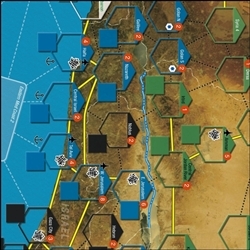 Players move their pieces across the spaces on the map and engage in various kinds of conflict in order to destroy enemy forces, seize critical objectives, and change the Netwar Index, which is an index used to indicate how successful each side has been in meeting their goals. Furthermore, one unique feature of the Holy Land is that as units engage in combat, their effectiveness may increase or decrease as they gain experience in fighting, or become demoralized. 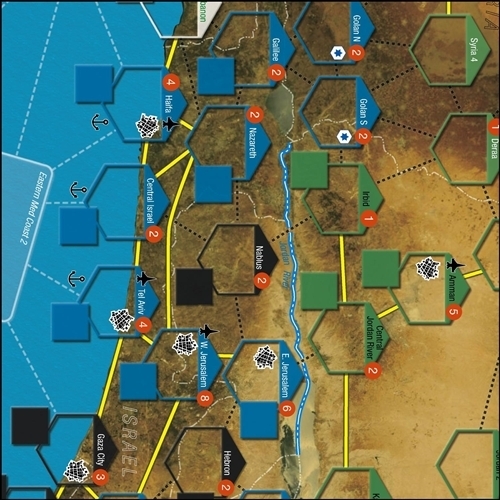 The game map shows Israel and adjoining countries, divided into large rectangular boxes known as regions, representing the general geography of the area. Players deploy their units into region boxes. The game includes two maps (22x34”) and 352 counters.